This is that rare thing that is a pleasure to discover – a text which manages to present important philosophical ideas in ways which are both challenging and assessable, and which in the process illuminates a significant area of clinical practice. 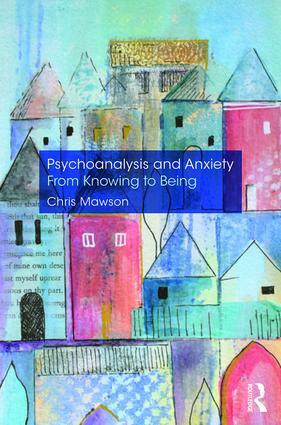 Chris Mawson has written a remarkably lucid and scholarly book which offers a much-needed bridge between psychoanalytic and existential formulations of anxiety. It will be required reading for anyone interested in contemporary psychoanalytic or existential therapy, not least because of its rigorous account of the common roots of both in the ancient world, and the engaging way in which it traces these influences down the centuries to the present day. This is a finely-crafted book which shines with veracity and knowledge – a joy to read and a valuable resource for all practitioners, regardless of their theoretical orientation, who are concerned to engage as fully as possible with those who consult with them. Some of the material presented here will be familiar to existential therapists, but the comparisons between the work of, in particular, Heidegger and Bion provide enlightening and compelling new contributions to an understanding of the irreducible fact of anxiety which unifies both the psychoanalytic and existential communities. Mawson’s work promises to stimulate and provoke practitioners in equal measure. A ground-breaking book which deserves the widest possible readership.